The hotel was clean, the rooms were spacious, modern and beautiful. The views were amazing and the location exquisite. There was a variety of entertaining things to do and see, from walking the boardwalk, to shopping, to going to the movies and the wonderful dinner and dessert locales, there is something here for everyone. As well, the price was right. The Gym was a little small and it didn't have as much equipment as I expected. It was almost like the gym was an afterthought. For someone like me, who likes to visit the Gyms at hotels, this was a tiny bit disapointing. It was the middle of the summer and my husband and I found ourselves with an unexpected child-free weekend courtesy of my lovely and generous in-laws. With glee, we started plotting. Should we just enjoy a “staycation” and wander around our neck of the woods sniffing around our old but trusty haunts? Or should we venture out somewhere new? Pretty quickly, we settled in on wanting to go somewhere new, preferably near some water and with a wait staff that could hand us a fruity drink now and again. The only dilemma we had was not living anywhere near the beach, in fact, living in Dallas, TX, we were a good 5 hours away from one. Since we only had a weekend, we really didn’t want to spend almost a full day on the road driving, however, we really wanted to get the “beach” feel, so what to do?? Luckily, we were happy with any body of water, and, being that Dallas is surrounded by many pretty picturesque lakes, we knew there just had to be a pretty lakefront hotel somewhere, and how right we were! 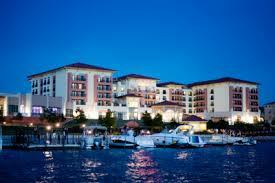 Just 22 miles east of Dallas, sits a very pretty lakefront Hilton hotel in Rockwall, TX. Off we went, with our sunglasses and bathing suits, excited for a weekend of fun. On arrival, we were warmly greeted by the hotel staff and shown to our room, a lovely room with a Queen bed and all the modern amenities you would expect, but the best part were the large glass doors leading out to a balcony overlooking a sparkling pool/bar area and beyond that, the very gorgeous Lake Ray Hubbard. After situating our things, off we went to take a walk and explore the grounds. Adjacent to the Hilton was The Harbor Rockwall, a beautiful boardwalk development with fun shops, restaurants, boutiques and a movie theatre, as well as a fountain and walking paths. Now, here’s the funny thing, we were expecting lots of fun in the sun for this little weekend away, but instead it was drizzly and overcast. But that didn’t damper our spirits, or our fun, in the least. In fact, the overcast skies meant a drop in temperature to a lovely 70 degrees, which to us, was perfect. So, off we went to explore the hotel grounds and the surrounding boardwalk area, to get a feel for what shops and restaurants were around. As we looked around in delight and thought about which restaurants we would try, we saw many young families enjoying the afternoon on the boardwalk, and we even saw musicians setting up for a concert that would play later that day. As we walked further on down the Boardwalk, we came across a beautiful custom made boat named the Seawolf, that offered sailing lessons or a simple champagne cruise on the waters of Lake Ray Hubbard, for a pretty reasonable price. Dinner was at Gloria’s Restaurant, a unique and delectable dining experience that combined Mexican, Salvodorian and Tex-Mex cuisines. I had the most perfect tamales with a starter of pupusas and a delicious strawberry mojito, which was at half price because we happened to hit Gloria’s at Happy Hour! My husband had the carne asada meal with rice and beans and he was in heaven. In fact, we loved our dinner there so much that we ate there the next night as well! Back to our hotel for drinks at the bar and lounging in our room, watching movies and relaxing. The next morning, we got in the car and drove a short distance to have breakfast at La Madeline’s Bakery, one of our favorite haunts. We were amazed at the variety of restaurants and shopping in Rockwall, quite a hopping and happening little city! The next day was more of the same, except that I made my way to the Gym to work off some of the incredible food we were eating. The Gym was small but functional and had everything I needed to have a great cardio workout, although, I must admit that it was woefully lacking in strength training equipment. No matter, everything else in the Hotel, from the pool, to their own restaurant within the hotel, to the wait staff and general employees was exceedingly excellent. In fact, I can’t wait to go there again and I hope that we make this weekend escape to the Hilton Rockwall a yearly, if not semi-yearly, treat! 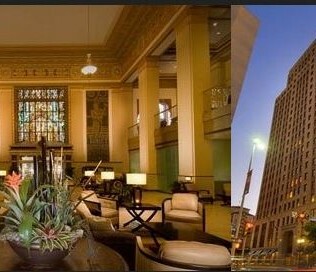 The Drury Plaza Hotel, Riverwalk: Even among exceptional hotels, this one stands out.